With data volume growing exponentially, protecting digital assets is becoming increasingly more challenging for most organizations. Unauthorized modification and relocation of data disrupt the normal business functions and can result in damage to reputation, legal penalties and financial losses. 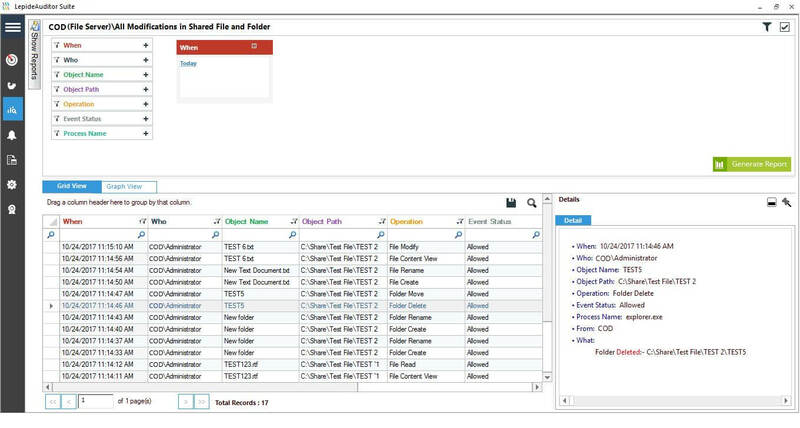 Proactive monitoring of changes made to files and folders helps to reduce cases of theft and accidental exposure of sensitive information. 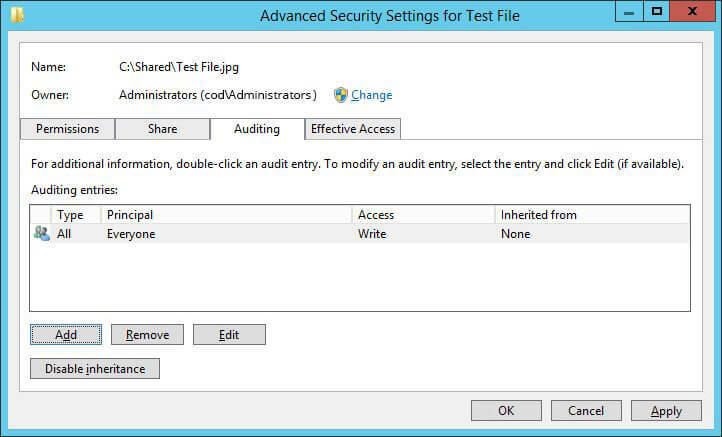 In this article, we will discuss two methods by which you can detect changes made to any file in a shared folder. One is using the native method, and the other is using LepideAuditor. Type “GPMC.msc” in the “Command Prompt” or “Run” dialogue box to open “Group Policy Management” console. 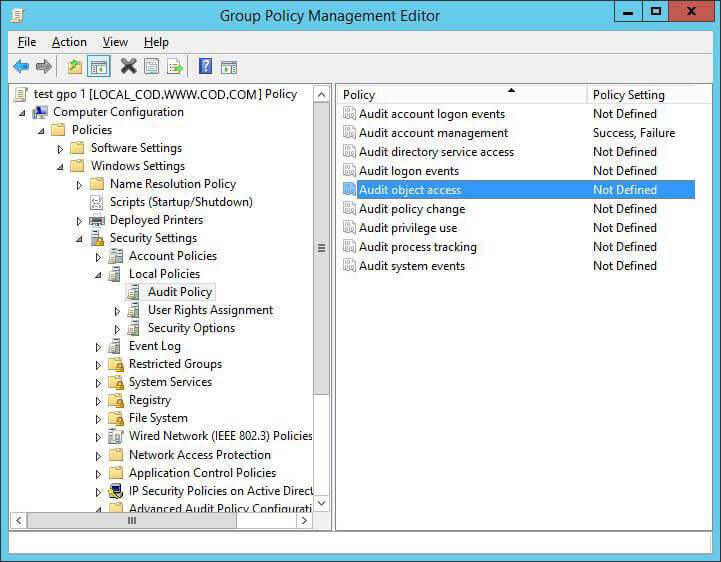 Note: We recommend you to create a new Group Policy Object (GPO), link it to the domain and then edit. 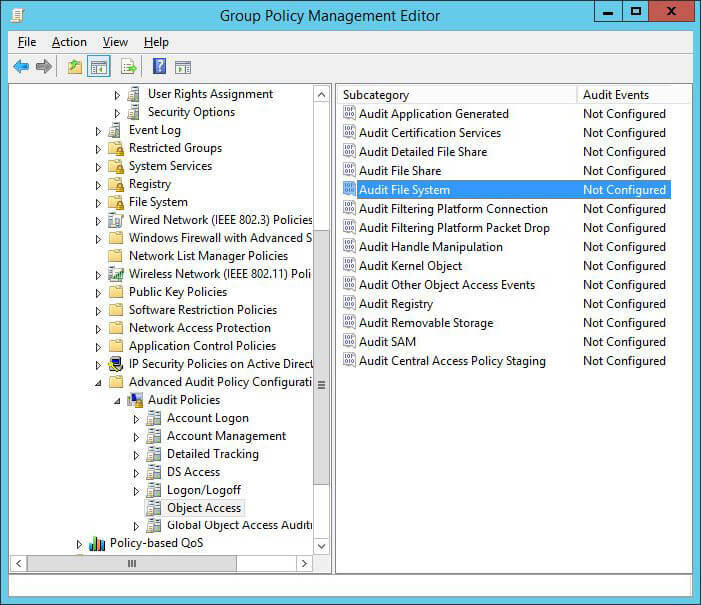 To access “Group Policy Management Editor”, click “Edit” in the context menu. Double-click “Audit object access” policy to open “Properties” window. Click “Define these policy settings”. 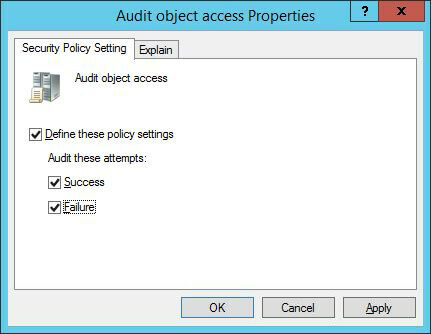 Navigate to “Advanced Audit Policy Configuration” ➔ “Audit Policies” ➔ “Object access”. Configure “Audit File System” policy and “Audit Handle Manipulation” policy. Open their respective “Properties” window and define the settings for both “Success” and “Failure” events. Click “Apply” and “Ok” after enabling both audit policies. You have to perform the following steps at the file or folder. If you perform them on a folder, these settings can be selected to be applied to its sub-folders and files. 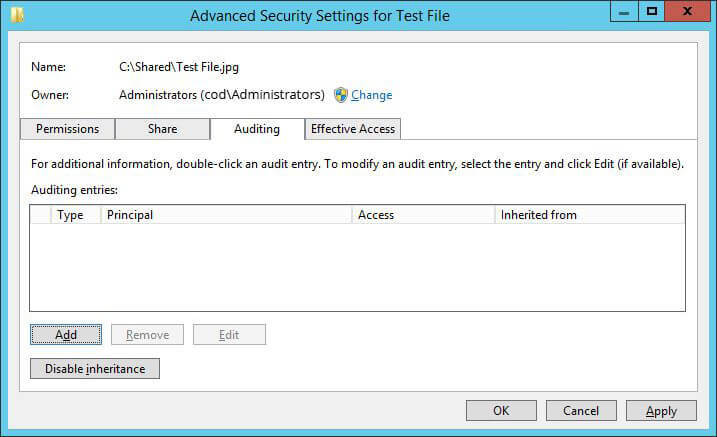 Open “Windows Explorer” and navigate to file share that you want to audit. Right-click the file and click “Properties” in the context menu. Switch to “Auditing” tab which displays already existing auditing entries. Click “Add” to create a new auditing entry. 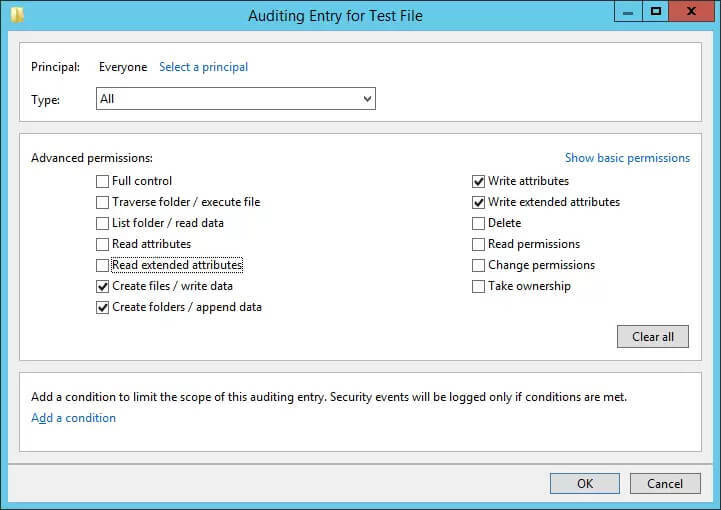 The “Auditing Entry” window opens up on the screen. Now click “Select a Principal” to choose the users whose activities you want to track. For tracking the activities of all the users, enter “Everyone” in “Enter the object name” box. Click “Ok” after finalizing your selection. Select “All” option from “Type” drop-down menu. Click “Ok” to close the “Auditing entry” window. It takes you back to “Auditing” tab of “Advanced Security settings” window. Click “Apply” and “Ok” and close file “Properties”. 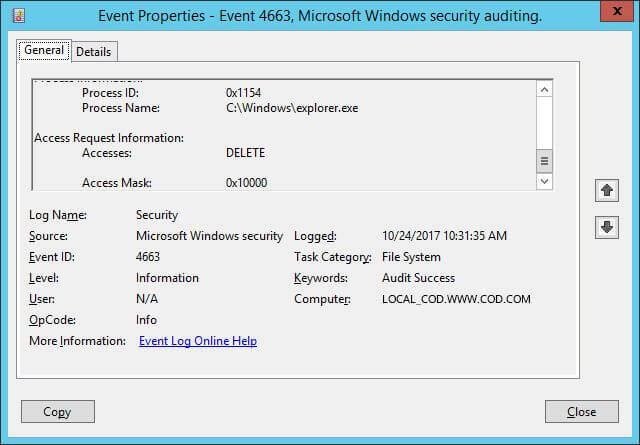 Expand “Windows Logs” and select “Security”. 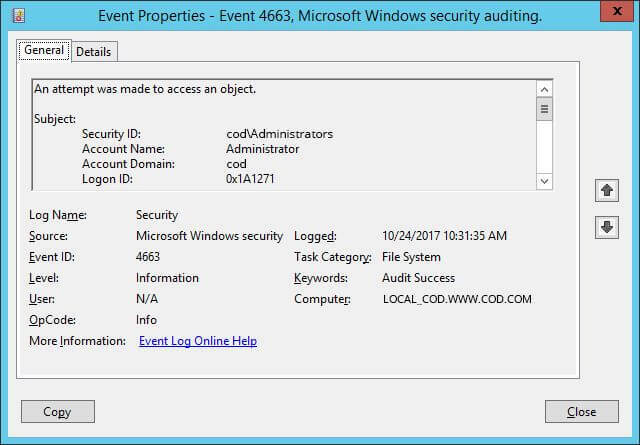 Event ID 4656 is generated whenever an application attempts to access an object (as per the set audit policy) but does not necessarily mean that any permissions were exercised. Event ID 4658 determines the duration for which an object was open. Event ID 4663 indicates if permissions like read, write, delete or rename have been exercised. The type of permission accessed is indicated by “Accesses” in the event details. 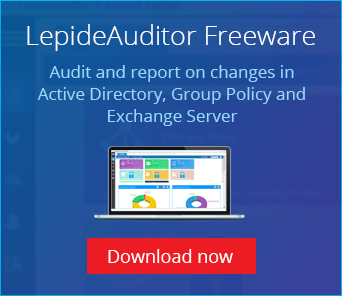 LepideAuditor empowers you with the ability to detect critical changes in your business enterprise without having to put in any manual effort. Granular reporting and real time alerts are just a few of the features that help you automate otherwise time-consuming tasks. The following is a screenshot of “All modifications in Shared file and folder” report generated by LepideAuditor for File Server. You can see here how easy it is to dive into all changes being made to shared files and folders. Why don’t you download the free trial today and try it out for yourself?